Hiding one’s face from either a brutal deformity, or possessing some amazing powers and contain whole entities, such as demons and gods. But don’t let that put you off donning a mask, whether it was this past Monday on Halloween, or if you just want to cosplay as a character with a mask, we’ve got just the list for you. So come and join us as we celebrate those who would shroud their faces, as we don’t need to see their full features to appreciate who they are. This is our Top 10 Masks list and you’d better believe these guys have nothing to hide. 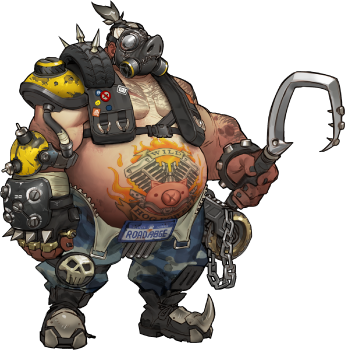 Starting lightly, Roadhog is a character from Blizzards universally acclaimed team shooter title. Although Roadhog can be described as anything but light, there isn’t too much to say about this individual. Massive health, massive size and a very smart theme to the destructive brute, this piggy certainly will be hooking you and blowing your head off with his shotgun. He can’t score much higher due to the fact he’s just one character from a very diverse range of characters. In a game where a hulking brute is second fiddle to a scout-like character who sparked controversy due to the way she stood, Roadhog is a giant amongst mortals. But, even with his incredible size, it’s not enough to topple the rest of the list. Still, we love his snout-esque gas mask! A powerful mask which comes to the aid of Crash and Coco in their times of need, Aku Aku is a sort of guardian spirit in mask form. When the two bandicoots are in trouble and in dire need of a friend, Aku Aku is there, floating around them to take the damage for them. He’s selfless and he’s brave; he’s smart and he’s wise – this mask is exactly who you’d like to find floating around next to you. Critical acclaim aside, Hotline Miami was kind of a big deal in the world of indie games. Playing through this gritty title as Jacket, whenever you start a level with him, you typically have to choose a mask for him to roam around in. Of course for fans of the franchise, the most iconic mask is Richard the Rooster, which brings no benefit to the player, but it’s a damn rooster mask and seeing that before you get shot up is pretty much terrifying. So in Mother 3, you play as Lucas. After you seemingly lost your brother due to a freak accident, your father Flint goes on an emotional rampage. Lucas, alone and afraid, sets out in the scary world, often encountering this horrible person, known only as the Masked Man. He was incredibly strong and seemingly quite young too, able to take out your whole party single handedly. Your life is only spared by your Franklin Badge, which deflects all lightning damage to the caster. Learning of this item, the Masked Man flees time and time again. But then, during the climax of the game, something happens. The Masked Man remembers who he was… No, who he is. He was Claus, your long lost brother. He slowly remembers in the middle of a fight with Lucas. It’s then that he finally feels as if all the weight of the world has been lifted from him. He realises the terrible crimes he’s committed in the name of a false idol… And he takes off his mask. Revealing himself as your brother, he smiles and finally casts his one last lightning attack. There, that wasn’t so hard was it..? Who’s cutting onions in here? Or Balrog, depending on what language you play in, Vega is a Spanish narcissist whose mask is as iconic as the claw blades he wields in combat. Fighting for beauty alone, the mask serves to protect his face from hideously disfiguring wounds or worse, blood splatter from his victims temporarily marring his glory. He has a loathing of the ugly, and goes to rather unpleasant extremes of violence and aggression when attacking anyone that does not meet his high standards. It’s fairly understandable of course, after seeing his mother killed by an ugly man and fixating upon that as a symbol of evil, and beauty as emblematic of heroism and bravery. The only alteration he has made to his own appearance are tattoos that mark him as a villain, iconic of his gang ties and associations with M. Bison’s super-mafia, Shadaloo. His face however is to remain unblemished… although I’d be seriously intrigued to see what happens if he ever gets scarred. Dishonored delivered a stealth gaming that the most recent Thief title simply couldn’t, and while the mask is not what won it a BAFTA or earned it a sequel (starring Stephen Russell of the original Thief Trilogy as Corvo Attano) it shapes that game in a rather iconic way. The skull like vision came to the visionary Piero Joplin in a dream – no doubt visited upon him by the enigmatic Outsider – in which he claims death himself stared back at him. Aside from becoming an icon of fear amongst the Dunwall aristocracy, Corvo’s mask serves to protect his face, his identity, contains a handy zoom function, and also represents a little of himself too, a fractured personality who bears the spectre of death, and the decision whether or not to bring that spectre down upon the heads of those who made him appear to be a murderer. Seasonal, I know, but the nature of Guy Fawkes has rather changed over the years as general mistrust in politics grows, and rebellion struggles against the comfortable chains of cushioned lifestyles. In the comic V for Vendetta we are introduced to a man who adopts the face of that famous failed terrorist who was caught before managing to blow up parliament. He has taken on the personal mission to finish what his adopted likeness began. Hugo Weaving superbly delivered the character to us in the 2005 film, and it’s no small feat to perform behind a fixed smile. Yet we are given rage, passion, calculation, sorrow, and joy, all concealed so cunningly behind that vicarious visage, and delivered through subtleties of movement, measured words and timed silences. Little wonder that the face replaced the green morph suit that had once represented the more anarchic divisions of the Anonymous anti-establishment movement. The truest masked murderer of all, Jason Voorhees is one of the world’s most iconic characters in any medium. A true slasher icon, a horrific and terrifying presence and all in all, an amazingly memorable design. The hockey mask came to represent the fear that he brought, rather than the sport the mask was designed for. Of course, he’s not the only masked murderer around. The concept of a masked killer however is a rather hard one to judge. We’ll check back to see how many votes each one got by Monday and we’ll see who you all deemed to be the best masked murderer of them all! What can we say, other than the fact that this mask is not only titular to the whole game, but it was featured in one of the most important RPGs ever to be released? You take up the helm of Link once more, going about your heroic deeds to go and save Hyrule… But oh my, you’ve been met with a terrible fate, haven’t you? 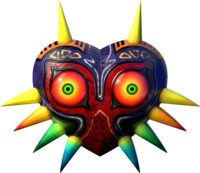 Majora’s Mask features many different masks, from the amazing Deku Scrub, through to the Majora’s Mask itself. The looming creepy moon, the feeling of impending doom you feel as you play this game is simply staggering… And it’s made even worse as you’re presented with various scenes where Skull Kid is wreaking his havoc upon the land. This was one of those games that shook the very foundations of what video games could be… And it got a very fitting re-birth in terms of its 3DS remake. Jim Carrey I would label as an acquired taste. He has his style and it is the over-the-top goofy exaggeration of everything that one might call over acting if he weren’t so very good at it. It may seem odd to some that he’d be chosen to play a man possessed by a mass murdering green mask known simply as Big Head. Oh yes, the original Dark Horse comics painted Stanley Ipkiss a very different shade of green, lots more blood, gore and violence than you’d want from the family friendly version we got to see. There’s surprisingly little overlap between the two, Stanley Ipkiss finds a mask that possesses him, gives him incredible power that helps him secure the woman he loves, take down some mobsters and generally be a glorious anti-hero. The character was originally a cross between The Joker and Jekyll and Hyde, and would never have samba’d his way free of an army of cops. There’s a whole world of trivia to delve into with these two, from the differing origin stories, to the spin-off where DC’s Joker gets to don the Mask. But if you loved the film as a kid like we did then get your hands on some comics, because things get a whole lot weirder. Of course masks are a rather hard concept to get your head around, (or indeed into). Where does the definition of a mask end and a helmet begin? It’s hard to say, but what we know is none of our list are considered to be wearing a helmet. Perhaps a helmet needs to be a hard construct which covers the entire head? Either way, in definition of the worlds they’re from, these characters are all masked or are masks. Nevertheless, here’s some more masked goodness for you! Following a short burst of “edgy” toys directed at older kids within the Technik range, Lego struck collectible gold with the masked warriors, the Bionicle. The Toa were powerful heroes washed up on the isle of Mata Nui, gathered their masks of power and set about saving a world they barely knew. Each mask gave them a unique strength,ability, and a certain distinctive style too. And they weren’t alone either, generations of Toa followed over the years (and are still being released today) all with their own mask collections. Mask powers vary, from simple strength, and speed, all the way to manipulation of space, time, the very minds around you. The Bionicle range came under some controversy for using the names of Maori gods and similar use of their language, Kanohi itself is the Maori word for face, but the series endured, and now we see a leviathan range that only now seems to show signs of stopping. Did you ever wonder exactly how easy it would be to make people think you’re someone else? I know everyone makes a huge thing out of Superman’s alter ego basically being him in glasses, but he puts on a tremendous act for Clark Kent, let’s not forget those heroes who cut holes in a sleep mask and thought they’d be safe from ever being identified. Who is that recognisable by their cheekbones and eyebrows that a tiny bit of black felt is going to function as a disguise. Robin/Nightwing, Green Lantern, The Phantom, Mockingbird, Black Cat, Black Canary, I mean really guys, come on, I know everyone rips on Clark for adjusting his quiff and ditching the tie in a phone booth, but really are you doing any better? Kudos if you get the ones that also turn your eyes into shiny white orbs, not sure how you’re doing that, but honestly, half a job can sometimes be worse than doing no job at all. And, y’know, thanks for saving the world a bunch of times I guess. That’s it, I’ve covered myself long enough and now I’m about ready to reveal my true identity. I’d not turn a blind eye to what you, our beloved readers, have to say on the matter. Whether you think some of these don’t fully constitute as masks, or if you think that we’ve not unmasked enough of these characters for you to decide, that’s all down to you to let us know… But before you do, could you spare a moment and vote for one of these three for next weeks’ Top 10? Now that I’ve finally revealed myself to all of you, it’s up to you to take a good look. Sure, these heroes and villains may be a bunch of misfits to you and me, but they’re ultimately the best chance we have. What do you think of our list this week? Do you think we’ve forgotten some rather important masked characters and have to tell us? Do you think we ordered some of these the wrong way around? Did you seriously not think of “The Mask” when you thought of “Top 10 Masks”? Let us know what you thought in the comments below, or over on Facebook, Twitter or Reddit. As usual, keep your suggestions pouring in!